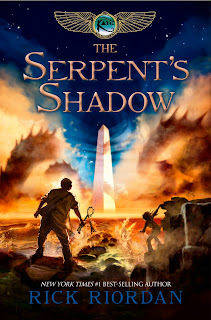 As announced earlier tonight on NBC's Rock Center, the title of Kane Chronicles Book 3 is The Serpent's Shadow! Above is John Rocco's amazing cover. I think it's my favorite Kane cover yet, and it was certainly my favorite Kane book to write. In this book, all your questions will be answered: Can Apophis be stopped? Will Ra ever be whole again? Is Bes really gone for good? What happens with Carter and Zia? And, of course, what happens with Sadie, Anubis and Walt? The book will be out May 1. I hope you enjoy it! *A story from Luke Castellan's point of view, from the days when he adventured with Thalia and Annabeth. Many people have asked me to write an adventure prequel to The Lightning Thief. Here it is! *A classic first-person Percy Jackson story, the first I've written since The Last Olympian. In this adventure, Annabeth and Percy's date is interrupted by the god Hermes, whose staff has been stolen by a fire-breathing giant. This cannot be good . . .
*A Leo Valdez story, set at Camp Half-Blood. As Leo builds the Argo II, something goes terribly wrong. Now Leo will need the help of Piper and Jason, or the entire camp might be destroyed. *And, as announced on Rock Center, the anthology includes a debut short story from my son Haley. Since Haley inspired the entire Percy Jackson series, it seemed only right that I asked him to contribute his own original spin on Percy's world for this book. I was amazed at what Haley came up with. His brother Patrick, who's a tough editor, was quick to say, "Dad, his story is better than yours!" Haley ponders the question: "What happened to the demigods who fought with Kronos's army after the battle in Manhattan?" This is the story of one such demigod, and I have to admit, some of Haley's ideas are so good I wish I'd come up with them! Hope you enjoy that book as well. I'm very excited to share the new stories with you, and never fear, I'm still working diligently on The Mark of Athena for fall 2012 release. More details on that when they are available -- probably this summer.